Pearl is very commonly used by jewelers for making ornaments and other costly items including rosary. Pearl gem is available in varieties of colors. Original pearls are not easily available. Cultured pearls are in use now a day. Pearl is a compound of calcium and oxygen. This gem is mostly found in round shape. In astrology, gem stones are recommended on the basis of placement of planets in a horoscope. Moon governs this gem who is lord of Cancer Sign of the zodiac. Moon is one of the luminaries and is known for its influence on watery places, human mind, heart, sound sleep, on plants of juicy nature, mother and other females, on menstrual period of ladies and luster of their faces. Pearl should be used if Moon is giving malefic results in the chart. Pearl ensures good sleep and helps in overcoming insomnia. Mental power is strengthened and depression is removed gradually. Moon is also considered to have feministic nature and denotes tenderness and beauty. Moon also indicate mind of an individual. If Moon is positive and powerful in the horoscope, the person will be generous, beautiful and prosperous. If Moon is weak by placement in the chart or is in debilitated state or is in enemy sign, the desired results of Moon as well as the house it denotes cannot be expected. The person lacks confidence and suffers from instability, depression and insomnia. He hardly gets any peace of mind. Specially, Saturn-Moon, Saturn-Rahu and Saturn-Ketu combination or aspect on each other in the chart is considered very bad. The native never comes out of depression in his life. Gems affect the subtle energy field of human being. (To understand subtle energy, see our article Theory of Subtle Energy). Our energy and thought process and accordingly the actions (karmas) are governed by this subtle energy. 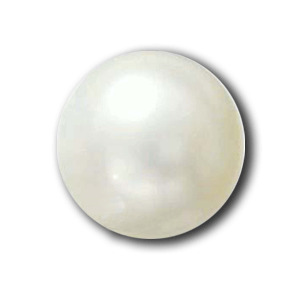 If malefic planets are posited with Moon, or Moon is placed in 6th, 8th or 12th house of a chart, Pearl gem can be worn. But finally before wearing this gem, the horoscope should be got analyzed by learned Astrologer. When Pearl is worn in a ring or in the form of rosary, the continuously vibrating power of Moon is absorbed in the individualâ€™s aura. Thus, the aura becomes more powerful to protect the individual from any obstacle caused through any external negative energy. The wearer gains confidence and feels energy flowing in him. Moon is also recommended for ladies and for emotional people to strengthen their will power. Those who are in the field of liquids including various types of oils, medicines, milk, chemicals, beverages and export/import etc. should wear Pearl gem with the consultation of learned Astrologer. Weak Moon in a chart denotes many health problems including diseases related to sleep, depression, insanity, weak mind, indigestion, asthma, T.B., heart problems, menstrual disorders in ladies and weak eyesight etc. Wearing Pearl can help in curing these diseases. Pearl should be embedded in Silver and ring should be worn on Monday morning (Shukla Paksha) after dipping the ring in Gangajal or un-boiled milk and energizing the Gem with the prescribed mantras. Pearl is considered a cold gem by nature.